Since 2012, all iPhones, iPods and iPads have been sold with Lightning charging cables, proprietary connectors made by Apple. The Lightning cables feature a chip that tells your device it’s Apple MFi (Made for iPhone/iPod/iPad) Certified. The MFi certification, Apple’s licensing program which requires developers and accessory makers to undergo rigorous testing for safety and reliability, is one of the reasons that Lightning cables tend to be rather pricey. 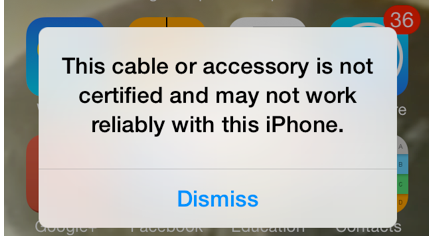 Unauthorized Lightning cables – like the kinds you typically find at your local CVS or gas station – are unregulated. MFi certified cables are built with a chip inside the Lightning connector itself that controls the amount of current being delivered to the battery. Counterfeit or uncertified cables don’t have this chip and so there is nothing controlling the current. This can result in poor charging and overheating, accelerating the aging of your iPhone battery. Excess current can also fry the internal U2 IC chip that controls battery recharging, leaving your phone completely unusable. Knockoffs – in any industry – are cheap because they’re made of lower quality materials. For a charging cable, this means low-grade plastic compounds and subpar electronic parts that make the connector feel brittle and tear easily. A common complaint from people who purchase these knockoffs is that the connector simply doesn’t fit properly or that the tip of the connector breaks off and gets stuck inside their phone. Back in 2013, Apple went on the offense and started working on solutions to detect uncertified cables and prevent them from working with the iPhone altogether. Now, when you plug the cable in, you might see the warning “This Cable or Accessory Is Not Certified” and that it may not function properly. The latest iPhones feature advanced chips that will simply fail to sync or charge when an unlicensed cable is plugged in. By far the biggest danger in buying an uncertified charging cable is that it could overheat to the point of catching fire. 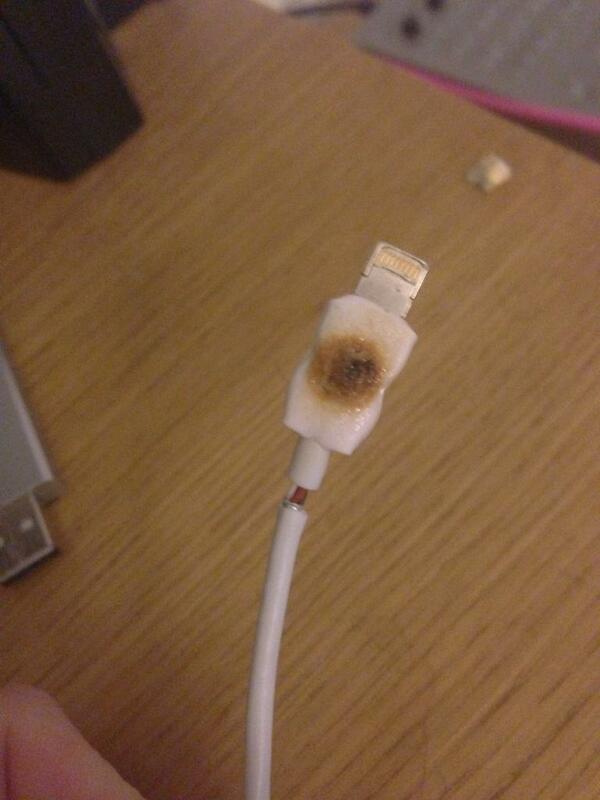 While exploding charging cables are certainly rare, the danger does exits. An independent safety science company, UL, ran a series of electrical safety tests on counterfeit chargers in their laboratory, finding that 397 of 400 charging cables failed a basic safety test. Twelve of the chargers were so poorly constructed that they posed a risk of lethal electrocution to the user! While uncertified chargers and charging cables might not shock you, a power surge in your home will most certainly fry your phone (in the best case scenario) – and burn down your house in the worst case. To conclude, we highly recommend sticking to charging cables that are either officially sold through Apple stores or that have received the MFi certification. 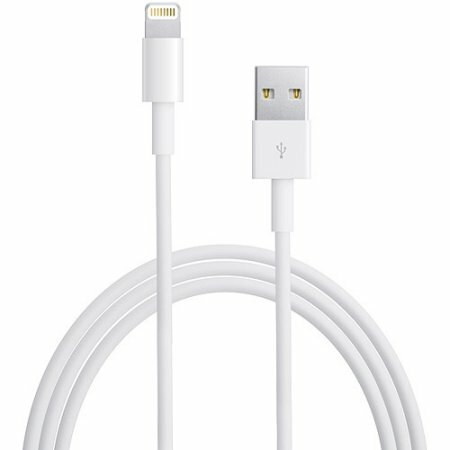 If you want to be sure the charging cable you’re purchasing is certified, read Apple’s handy guide to identifying counterfeit or uncertified Lightning connector accessories. At ChargeItSpot, our phone charging kiosks all feature certified cables, ensuring a safe charge. We recommend consumers do their due diligence when shopping online for replacement Lightning cables and stick to name-brand alternative manufacturers of phone accessories like Anker and Belkin if you want to reduce the risk of damaging your phone.